Samantha declines Justin's date invite after a talk with Joe, so Justin ends up asking Amber. Amber decides to go on the date because while she came to Paradise for Dan, he's a slow mover and hopes this makes him jealous. A walk on the beach leads to a whole salsa party happening so they join in on the dancing fun, with Justin getting shirtless to reveal his horrendous, splotchy sunburn. Does no one believe in skincare in Paradise? 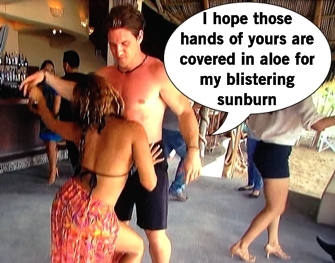 Sunscreen be damned, the couple start making out and now Amber is conflicted. After a post-date conversation, Dan admits he's not super into Amber like she is into him and doesn't want to lead her on. So now she's more torn and upset and wishes she didn't go on that makeout dancing date. But Dan does have an interest in one woman there... SAMANTHA. Jeez, she's cast a spell on these dudes. Chris Bukowski arrives in Paradise because I don't think these shows can legally exist without him. Chris Harrison jests. Chris Bukowski arrives with a date card in hand but is more interested in getting acquainted with the open bar. Well who wouldn't with Jorge behind the bar? The group is laughing at Chris' drunk antics, like nearly falling into a bonfire. Once Chris takes a pause from his drink, he asks Tenley out on his date and she totally friend zones him, and it's very awkward since Chris barely understands until she's short with him. Since Chris has no other prospects he'd like to date in Paradise, Joshua asks to take the date card instead. 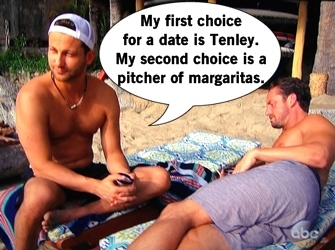 So ultimately Chris' date card is used for a date with Tenley, just not with him. They receive a food tour of Guadalajara from a chef, have a private meal prepared by the chef, and take a horse-drawn carriage ride. I saw not a single glass of booze this entire date, so Chris made the right call passing on this date card and keeping the open bar close. The cocktail party before the Rose Ceremony is a fair amount of campaigning for the non-official couples. 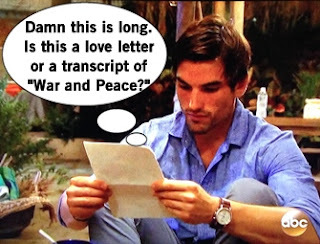 Ashley hands Jared an extremely long note to tell him her feelings, asking him to read and process which he does so aloud for the camera. But Jared remains a hot commodity, with Amber asking if he'd accept a rose from her. That dude is miserable on this show, completely lovesick for Kaitlyn still. Amber and Justin agreed to be friends, so she wanted to pursue other options she likes romantically and tells Ashley I. about her possible interest and SURPRISE, Ashley is upset. Dan is also upset that Samantha likes Joe more than him, so tries to change her mind. Dan believes Joe is still a villain and expresses that concern to Samantha, which is partially a strategy since Dan wants Samantha to choose him instead. Then Joe pulls a dominant move by interrupting the conversation to kiss Samantha in the trees, then let her return to Dan. Maybe Dan's peeing on the hydrant metaphor wasn't too far off. The Rose Ceremony begins with obvious roses: Carly to Kirk, Jade to Tanner, Tenley to Joshua, and Juelia to Mikey. I guess Ashley S. to Nick is an obvious rose as well, but since she drunk blabbed about them being like siblings I wasn't so sure. Ashley I. is called before Amber, so she gets the honor of giving a rose to Jared. With her first choice taken, Amber gives her choice to her new friend-only Justin so he can stay in Paradise and maybe find someone else. The final rose of the night will be handed out by Samantha, who has likely texted all the guys left standing at some point or another. 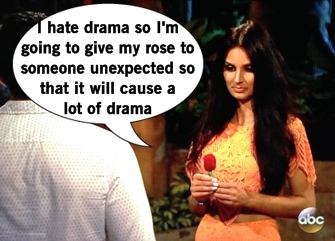 Samantha reminds everyone she hates being embroiled in the drama and gives her rose to Dan, shocking everyone. Joe is shocked by his elimination, which she reiterates is because of all the drama their relationship created. Samantha is being called the preying mantis of paradise, using her prey to get further. Joe is annoyed that Samantha still denies being part of their pre-show texting, with her insisting she came for 4-5 people and not just Joe. He wants to show everyone his phone to prove he's not a liar. 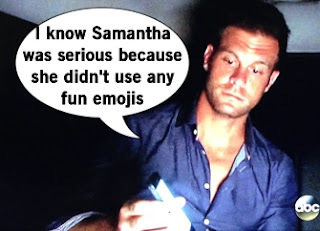 Samantha insists she came for lot and didn't plot, so in his elimination van Joe shows his text messages which do in fact tell him to do whatever it takes and not to get "wifed up." The proof is in the iMessage! Dan says the whole group is happy Samantha is there, but their faces say otherwise. Everyone agrees Joe is guilty but that Samantha likely puppet-mastered a bigger plan. Ashley S. asks how many people Samantha texted before this show, then babbles about Samantha's beauty, because she is the voice of the audience, the Shakespearean chorus if you will. Dense Dan thinks him and Samantha have post-Paradise potential, the biggest laugh of the night. But there's someone new in Paradise: Chelsea from Juan Pablo's season. Don't worry, I don't remember her either. Carly gives Chelsea the lowdown of who is available and taken, which is encouraging her to ask out Dan. Operation Eliminate Samantha begins. Speaking of not remembering someone, it seems Chris Bukowski disappeared into the abyss. Or fell asleep under the bar. Good night, sweet prince. What happened next? Continue reading my part 2 recap.